Can you draw? Even a little? I can’t, and I’m not even ashamed. My stick figure doodles are laughable and any real attempt to doodle is best left undone. Google, it seems, has a little fix for this impairment. Google’s latest AI experiment is a drawing tool that fixes your awkward, terrible doodles. 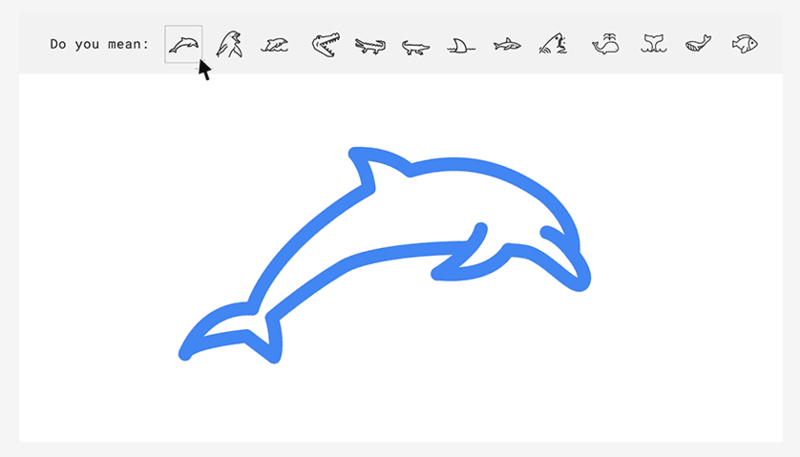 Can you draw a dolphin? A bike? Well enough to include it in a flier or a logo? Most of us can’t, and that is OK. But, in the event that you need to doodle something sharable to the public, this little web app can help out. Below, you can see a “logo” I made in about 2 minutes. It is handy, for sure! Simply draw your object as well as you can, and Auto Draw will suggest well-drawn items above the canvas that likely look better than what you did. They’ll definitely improve on what I do. If you are good at drawing, you can simply draw free hand as well. Additionally, some basic shapes and text tools are available, but don’t ditch your Inkscape or Illustrator apps just yet. The best part? It’s a web app, so you can use it anywhere on any device. Chromebook, PC, desktop or phone, you are good to go. Simply navigate to Auto Draw’s website and you can give it a try. Be warned, though, the site is blowing up and may take some time before you get in. We’ve seen a lot of ‘Over Quota’ messages, so keep trying and you’ll get in.